Dedicated Video Memory from System Memory on Motherboard after installing 8GB 2400mhz ram did not update to 1GB! HELP!!! I just bought a kingston 260 pin DDR4 sodimm laptop memory for my Dell Inspiron 15 5576. I need to find out why it still is saying 512MB still? 1xR 8GB PC4-19200-2400T SA1-11 2400MHz RAM both are the same type. Two 8Gb sticks are 512MB of dedicated video memory on the motherboard system memory. Now,What do I need to do to make it work or register it? It should increase the system memory size known on the motherboard dedicated video memory for the motherboard to 1GB. 1 8Gb stick is 512MB now installing the other should equal it to 1GB..
please reply with instructions on where in Regedit or BIOS to make this change to happen...or do I need to take the bottom stick out and put in in the top slot and put my new stick in the bottom>? I rebooted and came to a Dell white menu screen telling me that "My system memory has changed you need to reboot or reseat the memory"... and it has a big yellow exclamation point at the start of warning. Now,I just switched them back again to their original slot...still no change..
Is this the path to the amount of vram installed on my Motherboard? and this is what came up.. Under Windows, you can read the total amount of video memory in the registry. 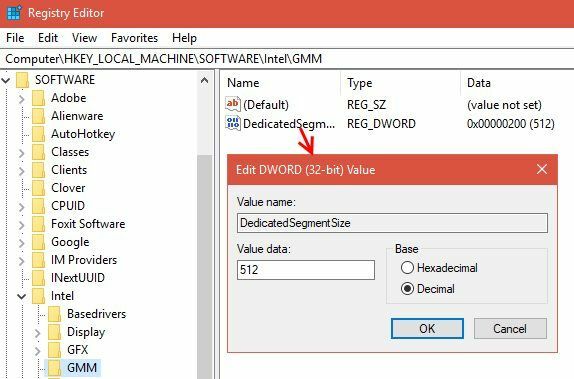 Step 1: go in HKEY_LOCAL_MACHINE/HARDWARE/DEVICEMAP/VIDEO and find the device key matching your video card, for example \Device\Video0. The string contains a path to the registry. Step 2: Go to that path. Find the key called "HardwareInformation.MemorySize". It contains the binary representation of the amount of VRAM. There's of course no guarantee it'll always work, especially in the case of non ATI / Nvidia video cards. Right-click the Intel folder on the left sidebar and choose New > Key. Name this key GMM. Once you’ve made it, select the new GMM folder on the left and right-click inside the right side. Select New > DWORD (32-bit) Value. Name this DedicatedSegmentSize and give it a value, making sure to select the Decimal option. In MB, the minimum value is 0 (disabling the entry) and the maximum is 512. Set this value, restart your computer, and see if it helps a game run. These methods aren’t guaranteed to work, but they’re still worth a try if you run into issues. If you don’t have a lot of system RAM and are having trouble running games with integrated graphics, try adding some additional RAM for the integrated graphics to use. Like most tasks, this is usually next to impossible on a laptop and simple on a desktop. On some forums I found a article on how to find the path that leads to the "Installed RAM 16GB on the Motherboard"
When I installed the other exact same type of 8GB RAM The system did not auto-adjust the amount from 512MB to 1GB. How do I find it on a AMD System with a R7 integrated and a Discrete GPU RX560 switchable Graphic system? Please don't change the Registration Figures for the Hardware Reported Values. UMA (Unified Memory Architecture) will scale the Video Memory from 512MB to 2048MB based upon the Game Demand. Still as noted this will *AUTOMATICALLY* rise to 2GB for Gaming (if Available)… and as a further note Windows Shared Graphics Memory, will also allow further Memory to be allocated (in this case up to 8GB)., which you wouldn't want to have happen if you were on a Dedicated Graphics Card; but as it's literally the same Memory for an Integrated Graphics Card; just means what's *actually* available is; well 8GB assuming it's not in usage by the OS. I want to know of the money is worth buying more 16GB RAM worth it in the long run or bail out and buy a better AMD Gaming Computer?Is the two 16GB RAM going to increase graphics and FPS values? I want to know where to get a Baffin Modern up-to-date Modified BIOS for my GPU and System to unlock the two cores in my system??? ?Is there any Mobile RX560 Pro Baffin Bios out there for the Dell Inspiron 15 5576? and have they (meaning anyone willing to test it) tried finding out if they are broken 2 cores or just firmware disabled which can be unlocked....???? 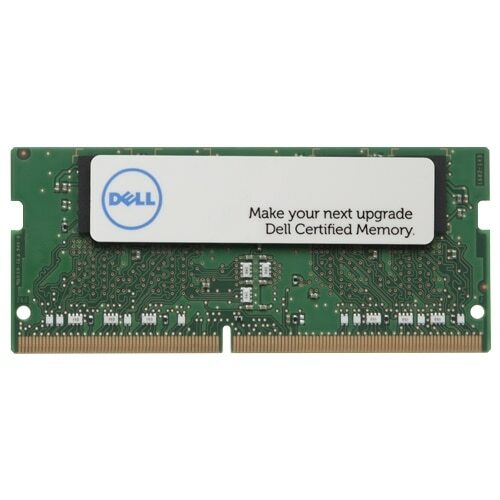 Went to Dell Support for your Laptop and under "Parts & Upgrades" this is the memory it shows for upgrading on your Dell Laptop: Parts & Upgrades for your Inspiron 15 5000 Series (5576) | Dell United States . Went to Kingston and inputted your laptop. The closest model was a 15-5577: Memory Search . From the world’s independent memory leader. Each module is designed, manufactured, tested and tailored to maximize the performance of a specific brand name computer system. Showing 3 out of 3 . It is possible that the RAM Modules installed are not compatible with your laptop. The Memory part numbers are not the same one you purchased at Kingston. According to Kingston, these three RAM Memory modules are made specific for your DELL laptop. Found out that you posted the exact same question at DELL FORUMS and the people knowledgeable at DELL seemed to have answered your question. https://www.dell.com/community/Inspiron/Dedicated-Video-Memory-from-System-Memory-on-Motherboard/td-p/6103756 . According to them, what you are seeing is probably normal for your Laptop and that each different Laptop model will show a different amount of Memory as being normal. So most likely the RAM MEMORY you have is probably fine as long as BIOS and Windows sees the full amount. So ignore all the information that I posted about the proper RAM MEMORY for your laptop. The RAM you have is probably fine as long as there are no issues booting into WIndows or showing the wrong amount of RAM MEMORY in BIOS or WIndows. Edit: changed the fonts to look normal after being written in Bold and Italic. Gave the wrong impression I was upset or something. yeah,kinda of diapointed...but ok..guess I m going to have t get that 1500 dollar rog for what I am seeking. Sorry to hear your situation. Must be really rough. Have you tried getting Government assistance in helping you find a place to live and possible find employment? Like I mentioned, if the RAM Memory you installed is working fine on your laptop then there is no need to replace it again. Only if you can't boot up or if Windows and BIOS is not showing the correct amount of Memory. Hope your situation improves in the very near future. the only difference is the MIH and the rest of the numbers being different.